We have finished our Advent preparations; we have celebrated Christmas, the Epiphany and the Baptism of Jesus. Now, as we begin what is called ‘Ordinary Time’ we meet Jesus as he openly and publicly begins his public ministry. When a politician wants to get themselves known to the public; they speak out publicly to attract people’s attention. They set out their programme and political agenda; they may even have a catchy slogan or phrase. Having being baptised and anointed by God with the words, ‘You are my Beloved, my favour rests on you’, Jesus goes to the temple. He stands up and reads from the Sacred Jewish Scriptures. He finds the place in the Prophet Isaiah and boldly proclaims for all to hear; ‘The Spirit of the Lord is upon me, he has anointed me. 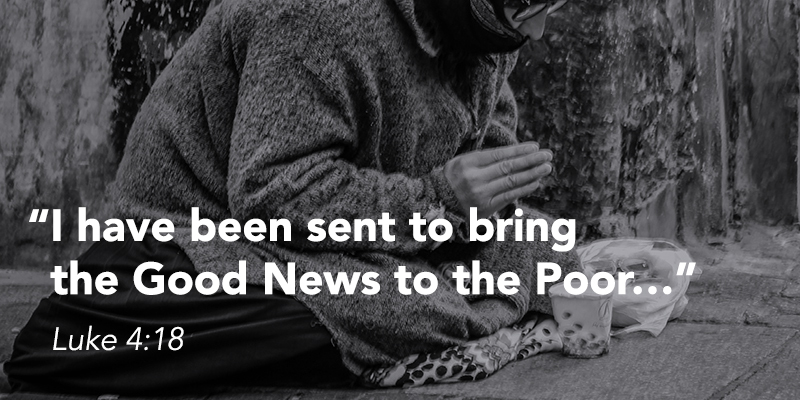 I have been sent to bring the Good News to the Poor.’ So when we ask why was Jesus born, this is our answer: he came to bring the Good News to the poor. What is this Good News? The Good News is that God created us, God forgives us and God heals us. God does this through the very person of Jesus Christ. Through the voice of Jesus, we hear God speaking to us personally and intimately. Through the face actions of Jesus, we meet and experience the tender love and compassion of God. At the time of Jesus if a person was sick in any way; blind, crippled, a leper or a widow, they were and treated as sinners. They were excluded, ignored and dismissed as being worthless in the eyes of God. But these are they very people that Jesus came to be with. Jesus came to bring the Good News that God loved the poor, the outcast, the ignored and the despised. Many people disliked and criticised Jesus because of his friendship with the poor. They even said, ‘Look this man even eats with sinners!’ But these were the very people who saw and recognised Jesus for he really was. It was the blind who saw him, the deaf who heard him and the crippled who followed him. Being a Christian is not just a pleasant name or a comfortable badge to wear. It is a way of life. To call ourselves Christians is to follow the one called the Christ. It is to live as he lived, to love as he loved and to treat others he treated people. As Christians, we are called to put our faith into concrete and real action in our daily lives. St James tells us that if we see someone who is hungry, naked or homeless but do nothing doing to help them, what use is that? Faith without good works is dead, he reminds us. We are called not only to hear the Good News from Jesus, we are challenged to live it and put it into practice whenever and wherever we can. May we do all we can to share the Good News of our faith with others, especially those who are poor, ignored and on the margins of our church and society today.